Ahsoka carries twin Lightsabers, which she uses to defend the innocent from the evil oppression of dark forces. When it's time for action, kids can place her Lightsabers in the figure's hands and squeeze her legs together to see her swing them both! This poseable figure features a colorful headpiece and true-to-entertainment sculpted details. 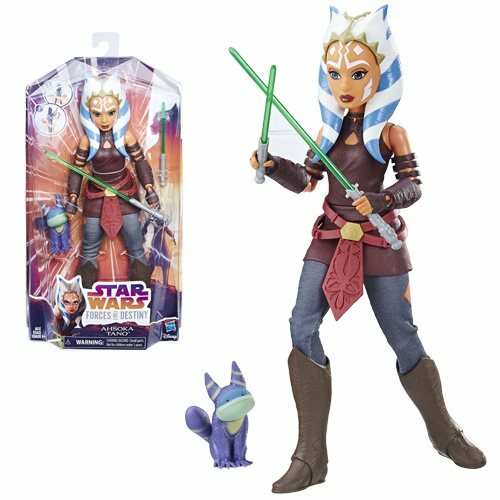 She comes with removable pants, boots, belt, and arm guard based on the outfit Ahsoka wears as she battles to protect the galaxy from the forces of evil. Kids can dress her in her outfit and accessories to get her ready for any adventure alongside her loyal pet Tooka cat. 11-inches tall.